The tweets were in response to Vikram Chandra's comment on Twitter on a news article about Pakistan Prime Minister Shahid Khaqan Abbasi's remarks at United Nations. 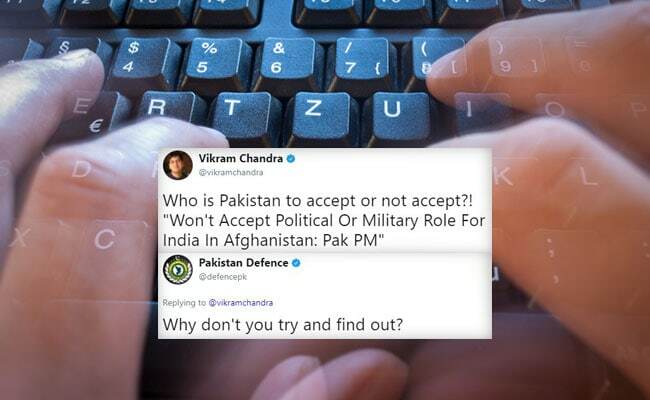 New Delhi: A verified Twitter handle of a Pakistani website that covers defence is being trolled for its tweets to NDTV's Vikram Chandra. The tweets were in response to Vikram Chandra's comment on Twitter on a news article about Pakistan Prime Minister Shahid Khaqan Abbasi's remarks at United Nations that they will never accept any political or military role for India in Afghanistan. The Pakistan Prime Minister's views were in response to US President Donald Trump's Afghanistan Policy. "Who is Pakistan to accept or not accept?!" tweeted Vikram Chandra along with a link to the article. Pakistan Defence, that describes itself as the "one stop resource" for Pakistan defence, reacted with a barrage of tweets which many labelled as 'threatening'. Among them a tweet that said, "Why don't you try and find out?" Afghans want to get rid of the American occupation and the quasi proxy Govt in Kabul. They want their sovereignty back and we'll help. Pakistan is the friend and kin of Afghan people. They know that its always Pakistan which stands up for them. What joblessness!! A verified strategic affairs account issuing veiled threats to a journalist for raising a valid question. Amazing! Shameful of the official tweet handle of pak defence responding with a threat to a journalist! Some brainless troll handles @defencepk Seems to have grown up watching Star Wars & Commando movies. How long India has been there in Afganistan? I am sure it's not new phenomenon. @defencepk ! You just love listening to your own voice. Vikram...in your next cool-head debate plz mention how Pak ISI trolls, threatens and harass Indian journalists! !